Twenty-seven thousand five hundred ordinary people, more or less, live in Agincourt and its hinterlands. And they are more alike than different, whatever pollsters may say. Sure, there are ideologues on both extremes of the political spectrum, but when push comes to shove—as it is increasingly wont to do—accommodation springs from our better natures. Is that what makes the Agincourt Project a work of fiction? I hope not. I’ve enjoyed, even relished, imagining its citizenry, though historical figures and past events have been more satisfying than contemporary figures in the present confrontational mood of the country. For it is ordinary people who do extraordinary things. Cherry-picking Bible verses is an armchair enterprise these days; the Good Book supports any position you may wish to take. So I invoke the familiar phrase “an eye for an eye” with caution, at least, and even a bit of irony. For today is the birthday of Theo Van Kannel, a man who gave that eye, rather than took it. The Chicago College of Pharmacy offered a two-year course to dispense pills and a three-year program to make them, which Theo completed with honors in 1902. Romance brought him to Agincourt in 1905 to marry Gretje van der Rijn, of the Dutch family that established our department store twenty years before. Van Kannel’s Sanitary Drug Co. opened its doors at the corner of Broad and James in October 1902 and though the name has changed, the Van Kannel tradition carries on in its one hundred and tenth year. But it almost didn’t. Theo and Gretje’s only son Bart was just eighteen when the United States joined the Great War as an ally of England and France. At the Battle of Cantigny on the evening of 28 May 1918 young Bart Van Kannel’s troop endured a flamethrower attack, a primitive but effective weapon that may have struck more terror than real physical harm. He lost his sight and was transported to hospital in Paris to heal and return to his family and the life of a blind man—until history intervened. In Agincourt, coincidence is commonplace and six degrees of separation are, frankly, pessimistic. That’s been my experience. So a remarkable set of circumstance brought Pvt Van Kannel to the Hôpital des Quinze-Vingt in the same week that Dr Eduard Zirm came to teach French Ophthalmologists the skills of corneal transplants; Zirm had performed the first such surgery only a dozen years earlier in his native Moravia. It took only two more weeks for Theo to be at his son’s bedside. Louis IX founded Le Hôpital des Quinze-Vingt, the French national eye hospital in Paris, in 1260—the world’s first institution for the blind (a more clear cut, irreversible condition in the 13th century). The congruence of venerable hospital, suitable patient, innovative physician and compatible and willing donor happens less often than it should. Though no one spoke of it on their return, the father had given his right cornea so that the son might see. 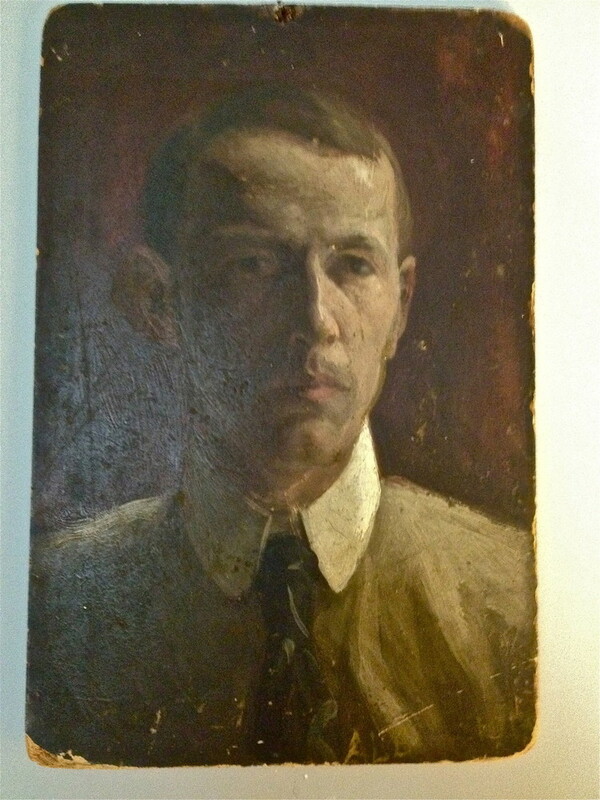 There is an attractive portrait in the Memorial Gallery collection, a handsome unidentified man painted about 1920. His expression is wistful; the right side lost in shadow. I have never asked but wonder if we are looking at Theo Van Kannel who is half-looking back at us. * The FF&M Bank at Broad and Agincourt still has the earliest installation of a revolving door in community history; Theo Van Kannel served on the banks board of directors. Yet another coincidence? By agincourtiowa in A few figs from thistles, Uncategorized on Monday/16/April/2012 . The following points are based in fact: 1) the portrait is a real painting from the 1920s; 2) the Van Kannel family did emigrate from Switzerland and bear several children in Ohio and Illinois; 3) Theophilus Van Kannel was one of those children and he did patent the revolving door; 4) the Chicago College of Pharmacy and its programs could have educated Theo Van Kannel; 5) WWI did happen (no surprise there), as did the Battle of Cantigy Woods on the date stated; 6) flamethrowers were a part of Germany’s arsenal of weapons; 7) the Hôpital des Quinze-Vingt was established in 1260 by King Louis IX and continues today; and 8) Dr Eduard Zirm did perform the world’s first successful cornea transplant in 1905. My contributions to this scenario are simple: Theo Van Kannel and his son Bart and the sacrifice that a father might make for his son. Dr Zirm did not necessarily ride out the war in Paris, however. Bart’s mother Gretje van der Rijn was contributed by Mark Roelofs.